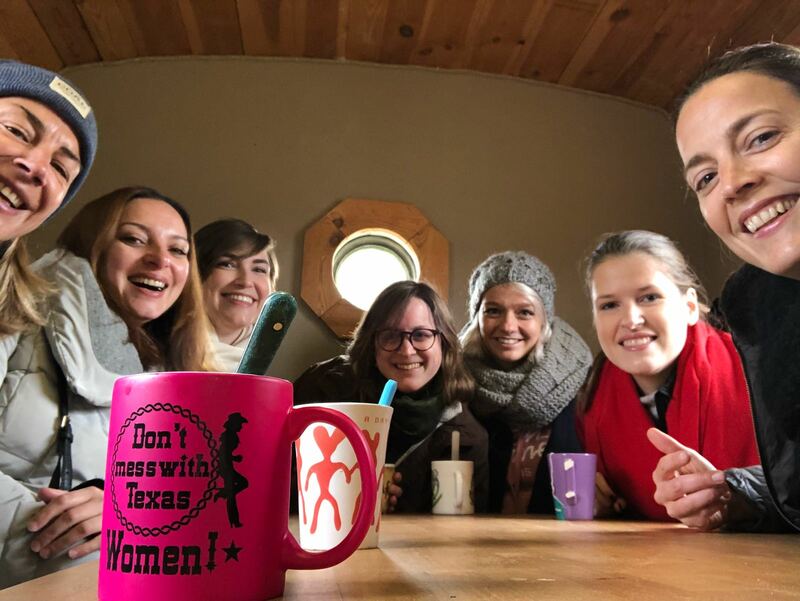 On a chilly – yet sunny – November morning, Andreea, Lidija, Maike, Vitis and myself headed out to Hoeilaart, to try out a new experience about which we knew fairly little and had no idea what to expect. Vanessa, a gentlewoman herself, a good friend and a former colleague, kept telling me stories about hippotherapy for quite some time. Therapy with horses, that is. At 40, she went back to school to study psychology and that’s when she really became passionate about this new form of therapy. As we were soon to find out, it can apply to both serious cases of trauma, as well as to personal growth and development. I was personally sceptical but open. I assumed that horses should be able to tell you quite a lot about yourself, but whether they can also help you improve or develop was a big question mark. 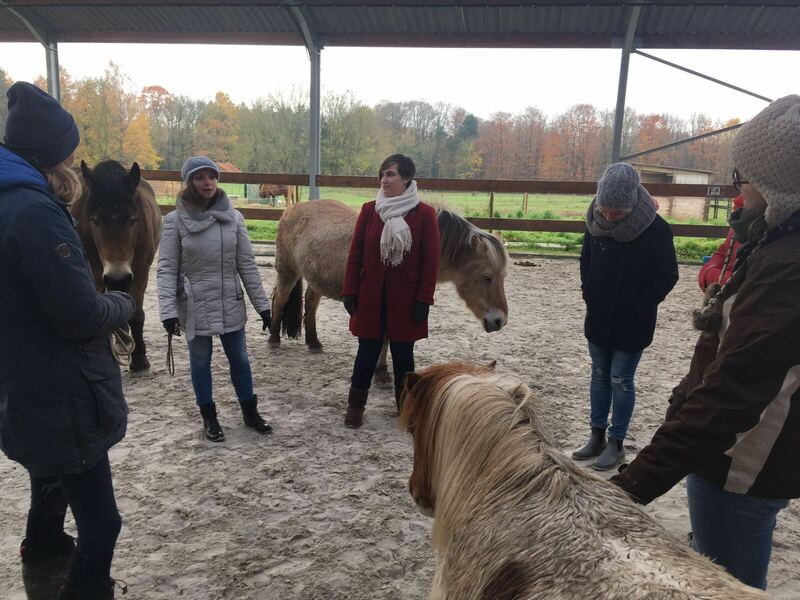 When we arrived bright and early on Saturday morning, we were warmly greeted by Vanessa and Geraldine de Ribaucourt, who is the founder of asbl Equité (https://www.equite.be/). Just outside of Brussels, it all looks and feels like a countryside paradise. Even Anna, the dog, is far too calm for a dog and used to the wide range of animals around her. There’s chicken, there’s a huge rabbit and there are, of course, horses. They are all roaming around freely on acres of green land. Fascinating. We had a brief introduction with Vanessa and Geraldine while sipping from our hot tea. 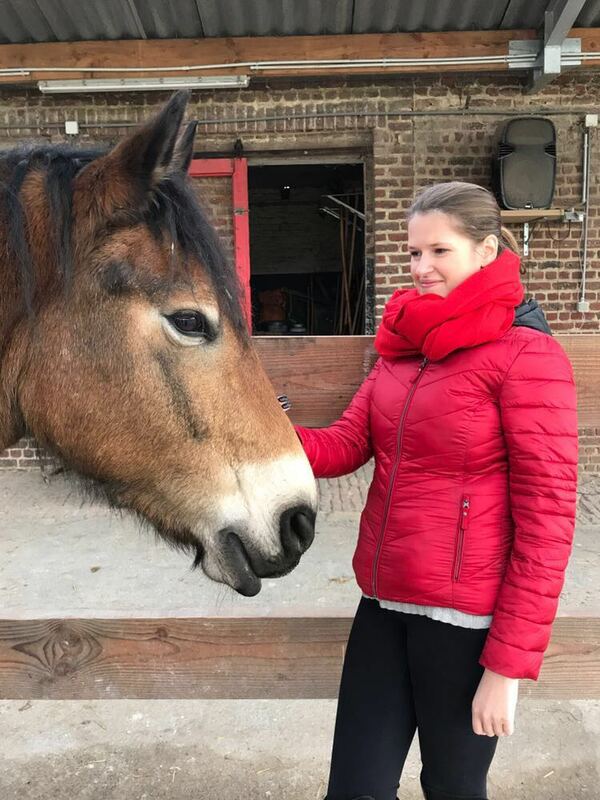 Geraldine is a psychologist who has been trained in Equine-assisted therapy in the US and in Europe and founded her therapeutic centre 15 years ago. 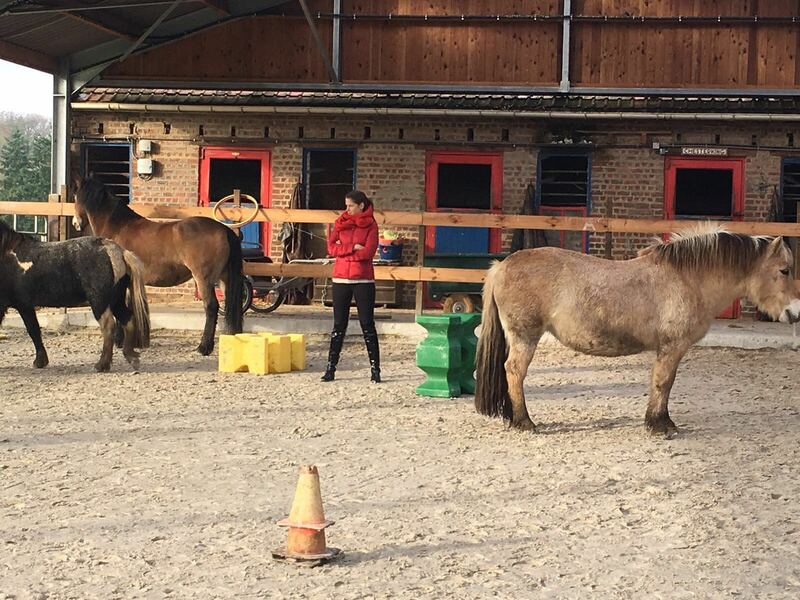 She is now focusing on personal growth programmes and psychotherapy with horses. Vanessa is completing a training at Université Catholique de Louvain and in the US and is assisting Geraldine in Equité’s workshops. Introductions done, it was time to meet our partners for the exercises: five very beautiful and very different horses, of all sizes and personalities. 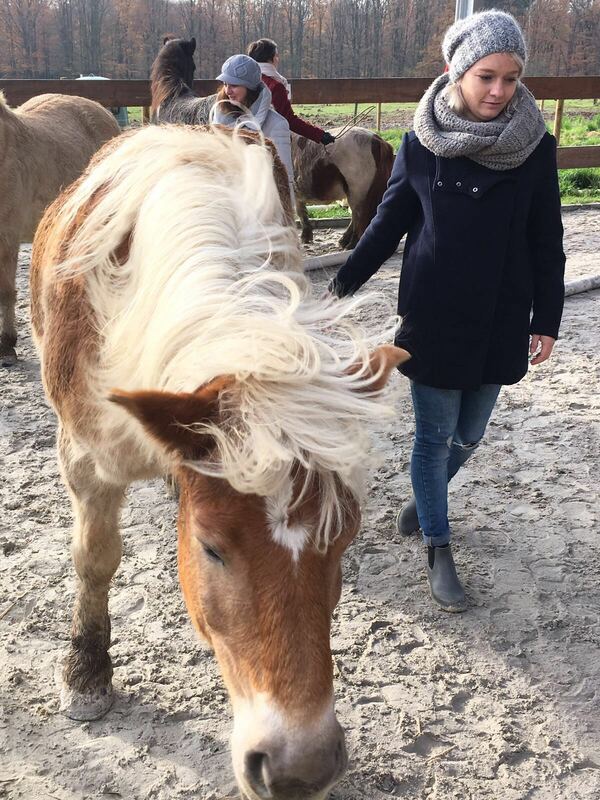 Some of us had previous horse-riding experience, some were newbies, yet all the horses were easygoing and friendly. Well, except one, but more about that, later. Our first exercise was going to be about defining our own space. 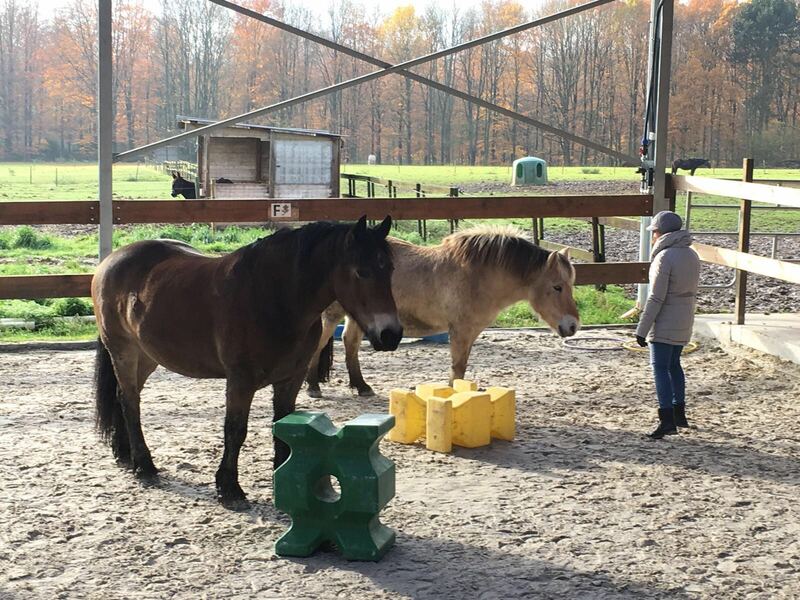 We used various objects around us to define it and then we had to make sure that the horses would not come into our space. Now, as you may imagine, shouting at them to get out was not going to do the trick. We had to find a way to actually send that message, through posture and energy. Look at me in this picture, there was absolutely no way any horse would come anywhere close. Which proved, to be honest, what I already knew: that, often on a first encounter, I seem tough and intimidating and people find it difficult to approach me. Our different personalities came out immediately. The tough ones in the group, the warm ones, the daring, the shy. It was fascinating. Pretty much like the horses knew us better than we knew ourselves. The second exercise was going to make us do the opposite. All of us had to make all the horses walk in the same direction. You’d think this is all to do with knowledge of how to train horses than with anything else, right? So did we. How on earth do you make a pretty big and naughty horse walk where you want him to? Or one who just wouldn’t move at all? We tried and tried, two would walk, two would give up, then none would walk at all. Until they all did. We discovered that what it took was connection, cooperation and team work. For the last exercise, we each had to pick one horse and try to build a connection with them to make them willingly walk next to us. This, for me, was the most interesting. Charlie, my horse, was the most misbehaved and energetic of them all. I had a tough time getting him to do anything. Vanessa kept telling me I have to mean it, but for a while I had no idea what she was talking about. Until… I really meant it. And when I did, good old naughty boy Charlie started to pay attention and we were walking together for… 3 seconds. That is when I realised that as soon as I lost focus on the connection and I stopped being 100% involved in the exercise, the horse started doing his own thing too. In the end, we got there. It took every ounce of focus and energy that I had to keep that connection going, but when it happens, it’s magic. 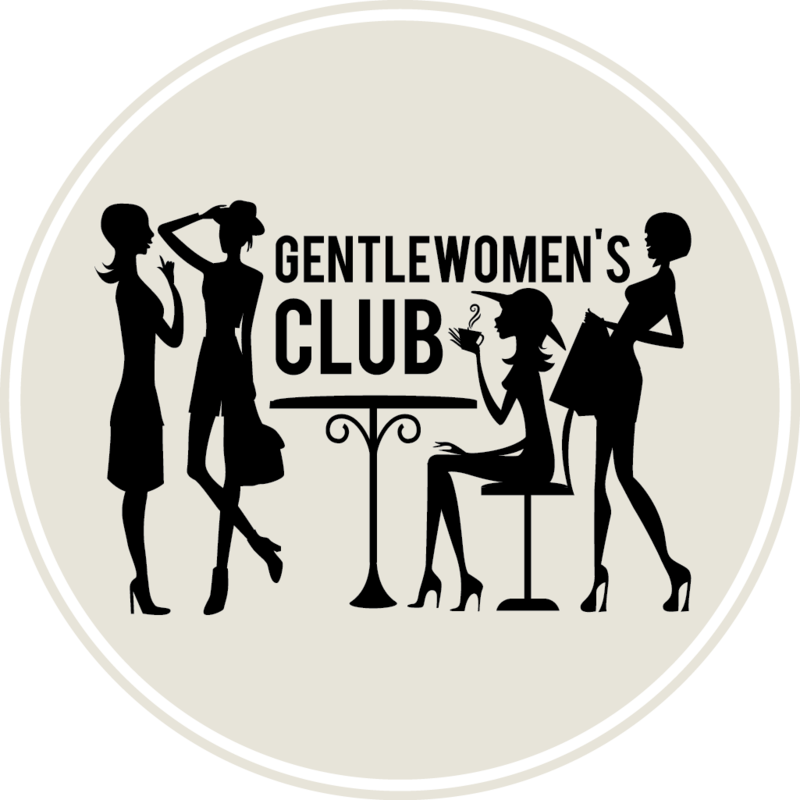 After our session, we bid farewell to our beautiful partners in crime and headed to lunch with Vanessa and Geraldine, where we carried on chatting about our experiences. What I found revealing was that everyone learnt something different about themselves from the exercises. We all did the same thing, yet we all had very different personal outcomes. A day well spent. A few hours out of Brussels, in nature, surrounded by these beautiful creatures, learning a lot about them and about us, in the process. So much you can tackle with this kind of method: self-discovery, confidence, assertiveness, leadership, motivation, focus. Literally anything. The power of these animals to read you and react to your inner energy and the knowledge and passion of Geraldine and Vanessa were pure fascination. Go out there and try it. You’ll leave touched and changed.